Like most competitive sports, the ability to endure will get you points. Although Balance Balls by Arvin Gatmaitan from 2010 Project Gameface is not a sport, there is a considerable investment in the time and energy it requires to train and become a champion of this game. The balancing game requires a great deal of hand-eye coordination and will test your reaction time (by how long you can last balancing balls). It will also test your patience. Gameplay involves completing two tasks at the same time: balance a small ball on a small platform and balance another ball on another platform right below the first one. You’ll move your finger to the left and right to control both platforms. Try to keep the ball in the air as long as possible. That’s it! When you lose (and it will be very soon into the game), you’ll get taunts that egg you on. For instance, “Do you have a brain at least?” and “Congratulations! You’re almost as smart as a poodle!” are some that you’ll frequently encounter as you’re learning to play. This alone makes the game highly addictive. 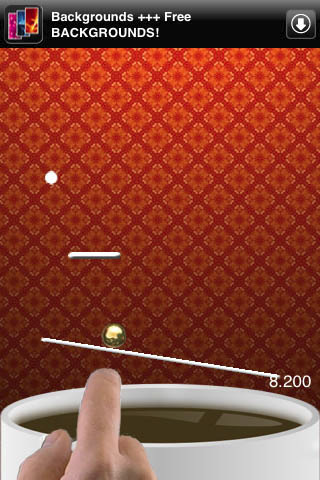 Balance Balls is easy to play, but getting past the 40-second mark is HARD. Yes, balancing balls is really, really hard. Who would’ve figured? Heck, getting past the 3-second mark proves to be difficult. Thank goodness for the hints, tips, and Youtube video Gatmaitan offers. See http://www.youtube.com/watch?v=sWlAmGJAzPg&feature=player_embedded for the video. The hints tell you that touching the smaller platform is not required to control it. Simply use the area below the larger platform and slide your finger left and right to make both platforms moves. And once you can get past the 40-second mark, submit your score to the online World leaderboard to see your ranking. As far as the appearance goes, the game is bare bones. That’s understandable since it is free after all. So you’ll see sponsors advertising free text, web browsers, March Madness, etc. If the developer cared to make the game better through some easy fixes, he might consider writing software into the game so that it remembers your name when you enter your score for next time. This would save me time when I could be playing the game. Also, music and sound effects would be a nice touch. There could be a “ping” or “ding” sound every time the ball hit the platforms. If created, I would appreciate it if the music and sound effects could easily be turned off too. And as one user suggested, the developer should add a replay button that requires a double-tap touch to activate on the finish screen so the user can play immediately after losing–this would shave off a few seconds. Overall, I’d recommend users give this game at least one go. If you have time to kill, Balance Balls is right up your alley at the cost of nothing (FREE!!) but your time. AppSafari review of Balance Balls was written by Linda Ta on March 18th, 2010 and categorized under Action, App Store, Free, Fun, Games. Page viewed 6674 times, 1 so far today. Need help on using these apps? Please read the Help Page. Very hard!!! yey, I got past 30!!! my new score – 39.68! I love this game!!! !